Japanese Metabolism was more than just an architectural movement: it was a lifestyle. Two young Portuguese architects, who currently reside in Kisho Kurokawa’s Nakagin Capsule Tower, report on their daily 21st-century life in one of the 20th century’s most iconic buildings. 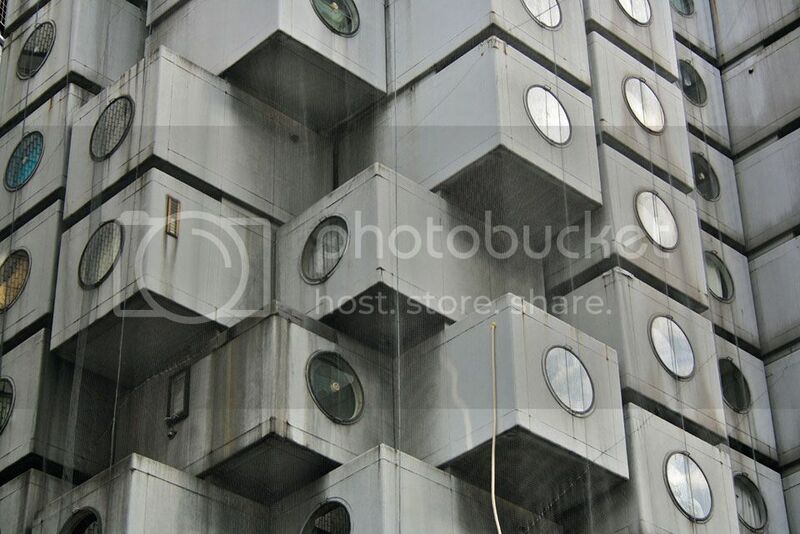 Sometimes you get lucky We first went to visit Kisho Kurokawa’s Nakagin Capsule Tower as architects (and tourists). We got lost on our way there and ended up arriving late in the evening. The initial impact was strange: it was as if we were looking at an old friend that we had known for a long time, an interesting feeling when you first visit a building you thought you knew everything about. Only one capsule had the light on. “Curious,” we thought. We entered the lobby, but the doorman quickly saw us out. “No visit! No picture!” were the only two phrases we could understand. Kenzo-san laughed, gave us his business card and said: “Maybe I can help.” Thanks to this encounter, a few days later we would be living in the Nakagin Tower. 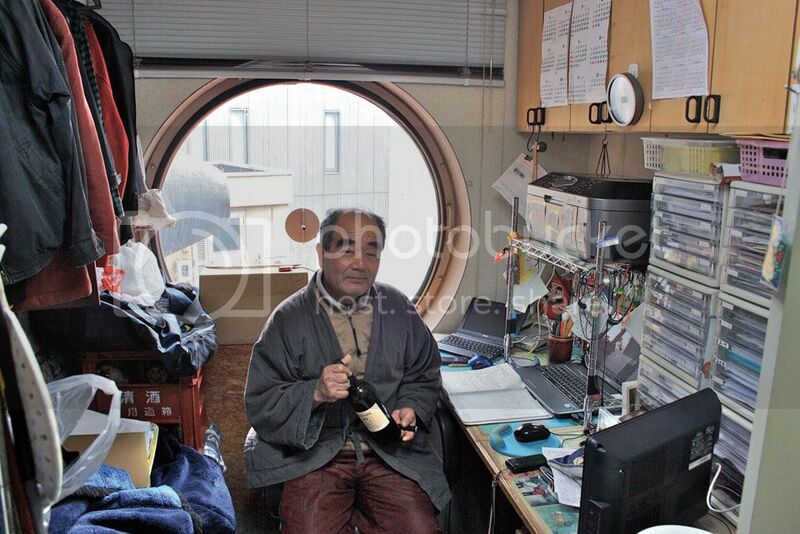 Indeed, Kenzo-san had his office in one of the capsules and a friend of his had another available for rent. We met his friend, who subsequently became our landlord, and he was delighted to find someone as enthusiastic about the building as he was. Inside, the space doesn’t seem that small. And, honestly, it doesn’t even seem so relevant in our daily lives. The capsule perfectly fulfils its modern function of a “machine for living” and, as a couple, which theoretically makes the experience even more extreme, we can live normally. We are happy here. 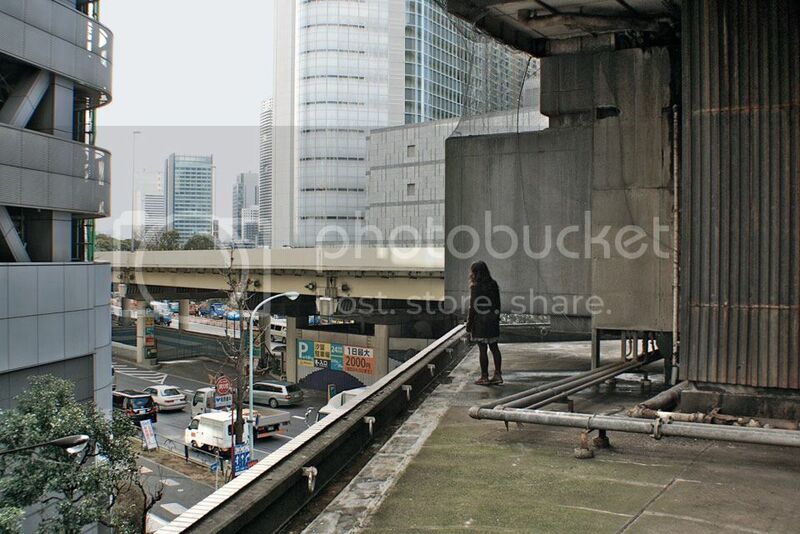 We prefer to live in a smaller space in central Tokyo than in a big house in the suburbs. Our routine is to leave home in the morning and return at night to rest. We feel like normal, happy examples of the “contemporary nomad” whom Kurokawa wrote about. Nevertheless, it still feels like we are living somewhere in between a hotel and a scientific experiment. The window is large and circular; it seems huge in such a space. Our room faces west, overlooking the surrounding buildings and the Shimbashi crossing, which at night is filled with lights. The frame is fixed, to avoid accidents, yet this precludes natural ventilation in the room. In the ’70s, all the windows had a round fan system that controlled the amount of light coming in, but today only the metal support in the middle of the window remains. As a result, and despite the fact that we put up a blue curtain, every day at 6am light invades the capsule. At first, sleeping was a problem, but now we are used to it. All the surfaces are in contact with the outside and the insulation is not particularly good. The result is simple: the capsule is sweltering in the summer and freezing during winter. 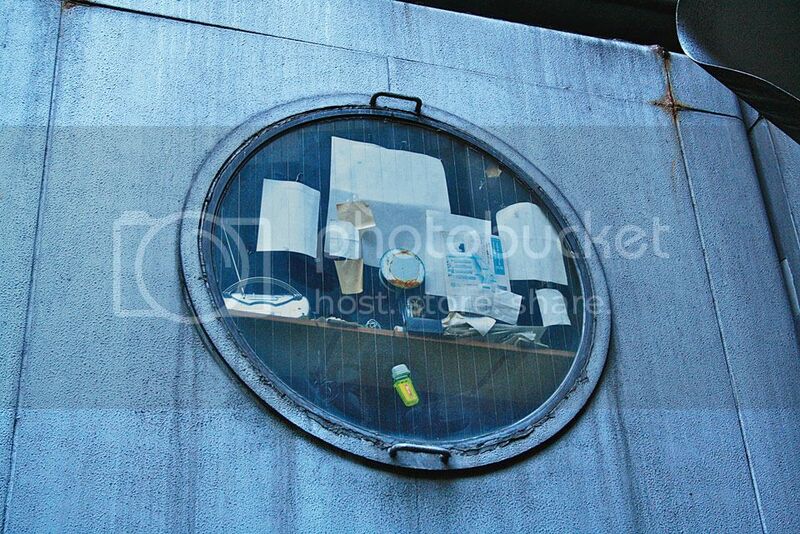 There is an enormous ventilation system integrated into the original design of the capsule. The wheel button allows three options: “fan”, “low” and “high”, but the air temperature cannot be controlled since it is set by the general system of the entire building. The air ducts are damaged in many places and some residents speak of possible contaminations. Even though we use an electric heater and the capsule is warm when we go to bed, all the heat quickly dissipates overnight. When we take off our jackets or get changed, we have to store everything right away. The space is limited, but ergonomics is all-encompassing. A 35-centimetre-deep closet covers the entire south wall and serves as the storage system for the capsule, simultaneously featuring a sideboard, a dining table, a wardrobe and a set of shelves to store other objects. There isn’t much space for coat hangers, but the table is large and folds away, disappearing when not required. It is relatively low, like a sink, but its latch is impressive: while the table is folded down in the horizontal position, the mechanism is collected in a cavity and becomes coplanar with the table, so your elbows don’t hit against it. The capsule encloses similar small details everywhere—in a very simple and almost imperceptible way, Kurokawa made living in such a space easier. As time passes, we get the feeling that maybe we don’t need more space than what we have now. The TV is not the original, although it is the same size. The radio doesn’t work and the only functioning buttons on the “control panel” are the ones that switch on the two sources of light in the room: a large central lamp and a small, individual reading light. The fridge is small and tight, like a minibar, but very useful. The freezer is not sealed and thus becomes the cooling unit. We were lucky that it works, because placing a standard refrigerator in that space would have been a nightmare. As it was designed for the man of the future, whose very busy life would leave no time for cooking, the capsule does not include any appliances, so we were forced to buy a small kettle and a portable electric stove. Sometimes we cook but it isn’t easy, especially if we’re both at home. After some experimentation, however, the process got smoother. We realised the bathroom extractor fan is so powerful that it can ventilate food smells from the entire room, and the table can be used simultaneously as a kitchen work surface and dining table. The secret is organisation (as with almost everything we do in the capsule). When we’ve finished cooking, we do the dishes in the bathroom sink and have to put them away immediately. During the night, we only hear the old refrigerator running. 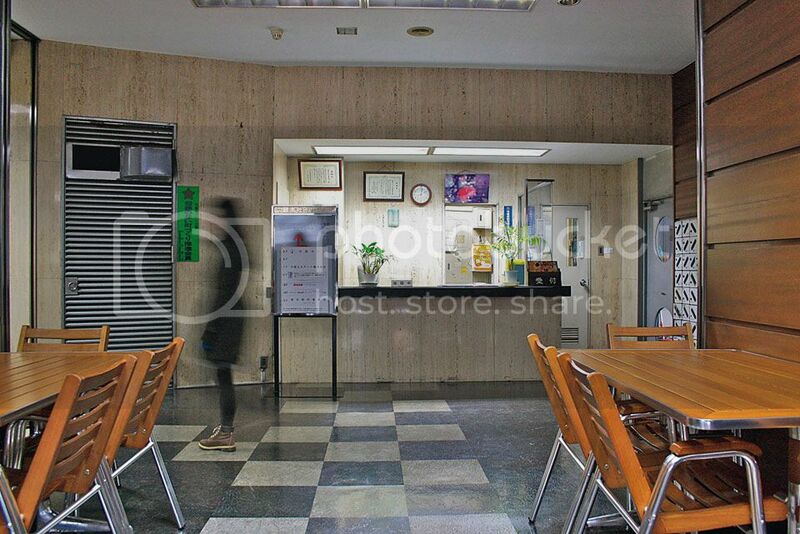 If we feel like eating something before going to bed, or if we’re just not in the mood to cook, we always have the convenience store on the entrance floor, which is open 24/7. The bed was a major problem. We couldn’t find a bed or mattress to fit the capsule, and we needed space to store our suitcases. Since we were having problems, and had access to the University of Tokyo’s carpentry workshop, we bought some materials and built our own bed, tailored to our needs. With a little diy philosophy we achieved a good result, and even added a few more boxes for storage on the bed’s accessible side. On top of the structure we placed an air mattress, which fits perfectly. The bathroom is particularly well organised. The walls are made of a washable plastic, turning the wc into a capsule within the capsule. In a visit to some of the abandoned units, the advanced state of disrepair of the remaining elements compared to the sanitary divisions was plainly visible. Since this is an interior space with no windows to the outside, the door has a round frosted glass window, which brings natural light into the bathroom. Despite the space’s minute proportions, there is a bathtub instead of a shower, something very typical in Japanese culture. The toilet, sink and tub are a single plastic piece that functions as a whole and organises the space. Soap dispensers, a lamp, a towel holder and some small shelves are subtly placed on the walls to avoid the need for a cabinet. There is an electric plug next to the sink, protected from water by a metal screw cap. To flush the toilet we press a button. We rarely see any of our neighbours, and despite having lived here for a few months, we’ve never come across anyone in the elevator. There is no noise in the other capsules and sometimes we have the impression that no one else lives in the building. Every time we leave our capsule and look up at the ninth-floor balcony, while waiting for the elevator, we remember the earthquake of late last December, when Tokyo shook and the tower rocked violently. The building is not prepared to withstand strong earthquakes, but after 40 years these events are seen as normal. We come from a country where there is no seismic activity, and for us it was scary to see the capsules colliding into each other. We dashed down the concrete staircase, which seemed safer, and on the way we saw some neighbours acting as if nothing were happening. In Japan, an earthquake is somehow part of daily routine. A couple of days later the building was covered with a net, as a “precautionary measure” and “only for a few days”, so as to prevent anything from falling onto the sidewalk. Maybe we’re wrong, but something tells us that the net is here to stay. Although it is known as “Nakagin Tower”, the building is actually composed of two attached towers. Each has an elevator core with a staircase going up in a spiral. On every landing there are two or three doors, but in reality there are many “landings” that don’t correspond to regular floors. There are 78 units in tower A and 62 in tower B. 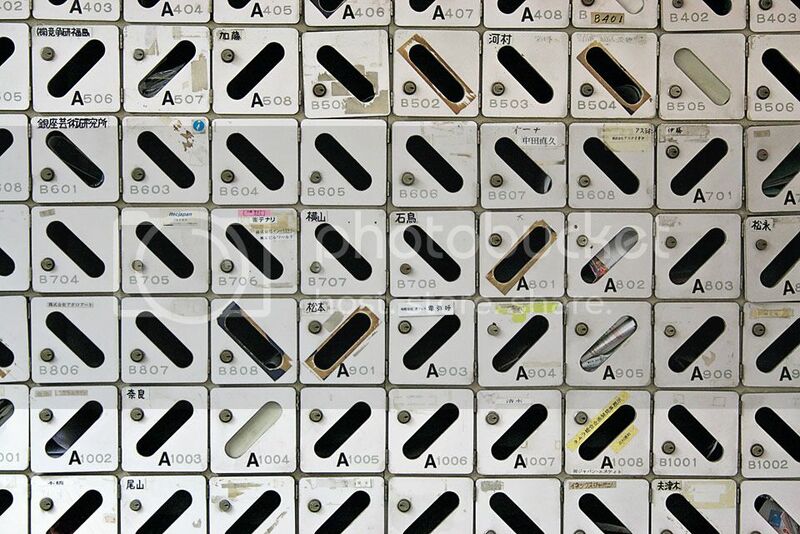 The numbering system is simple: we live in capsule B807—tower B, 8th floor, door number 7. Signs of previous residents are present all around the capsules and corridors. In our capsule, the most evident marks are the strange wallpaper, a carpet covering some degraded spots in the original flooring, and the air-conditioning unit that had to pierce through a wall in order to be installed. 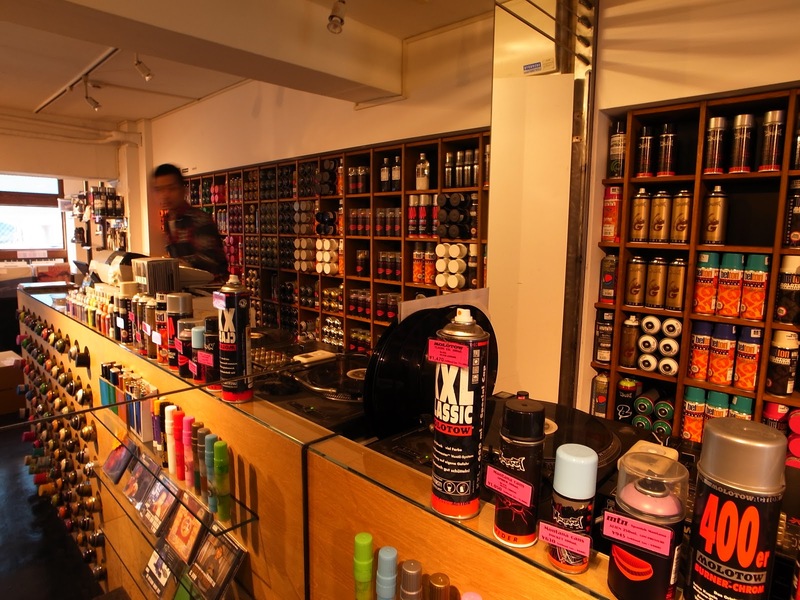 At Kenzo-san’s office, nothing original remains except for the bathroom, and the entire space is filled with revivalist furniture; a neighbour two doors down has created a warehouse and lined the interior with metal shelves. Most capsules are generally used for functions other than living. The interior spaces gradually get larger towards the staircase, which is suitable for storing bicycles, boxes, shoes, garbage, etc. There is no hot water in the capsules. In order to wash ourselves with hot water, we could either install a water heater by ourselves, or use the shower on the common entrance floor. Like most residents, we chose to use the common shower facing the street. Every day we have to schedule our shower time, which isn’t difficult since there are so few of us. Due to the deterioration of the plumbing, new pipes were installed a few years ago, but the job was done carelessly and the doors of the capsules were cut so that the pipes could pass through. Indeed, everywhere around the building it is clear that the structure was never respected whenever some kind of repair was necessary. All solutions are patches. 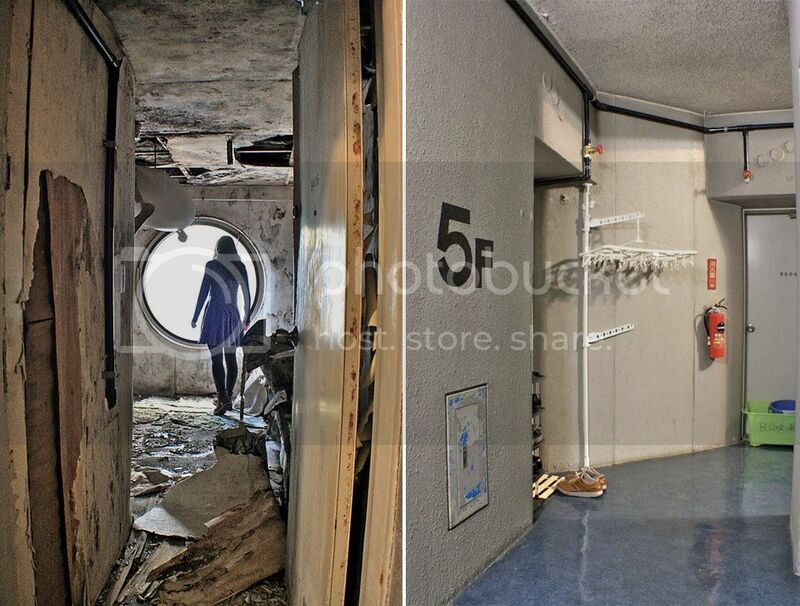 There are perhaps ten to fifteen people living here, and most of the capsules have been abandoned. Some are “sealed” with plastic, while others don’t even have locks so you can enter and see the advanced state of dilapidation: walls are crumbling, shelves are broken, and garbage, mould and moisture are everywhere. From the emergency stairs, outside, you can see damaged roofs and holes all over. The ground and office floors work normally and are well maintained, but the capsules are slowly disintegrating. The doorman leaves at midnight and only comes back at around 6am. The door stays unlocked all night. Tokyo is so safe that the building only needs protection from the hordes of tourists. Until he got used to us, the doorman would always run up to the elevator telling us we could not enter. We had to show our contract several times to prove that we were not tourists. Someone is invariably standing at the door every day when we leave. Dozens of tourists — predominantly architects — stand on the other side of the street taking pictures. Most of them try to get in, like we did months ago. Usually we are approached when someone notices that we are leaving the tower. In the beginning we were happy when this happened, and we would even show our capsule, but as time passed this became so frequent that we now comprehend the doorman’s brusque reaction to us the first night we came here. We often speak with Kenzo-san, who tells us that some of the remaining inhabitants talk of demolition as if it were imminent, even mentioning specific dates. Every day we hear new rumours and conflicting information. Nevertheless, a few days ago we met a young Japanese man who had bought five capsules and was restoring them by himself in his spare time. Despite so many abandoned and decaying units, somebody still believes in the building’s future. Contrasting approaches by the building’s diverse inhabitants outline an uncertain future. The demolition almost went ahead in 2007. Plans were approved and some owners were completely in favour of it, but a public petition with the support of the Japan Institute of Architects (JIA) saved the building at that time. 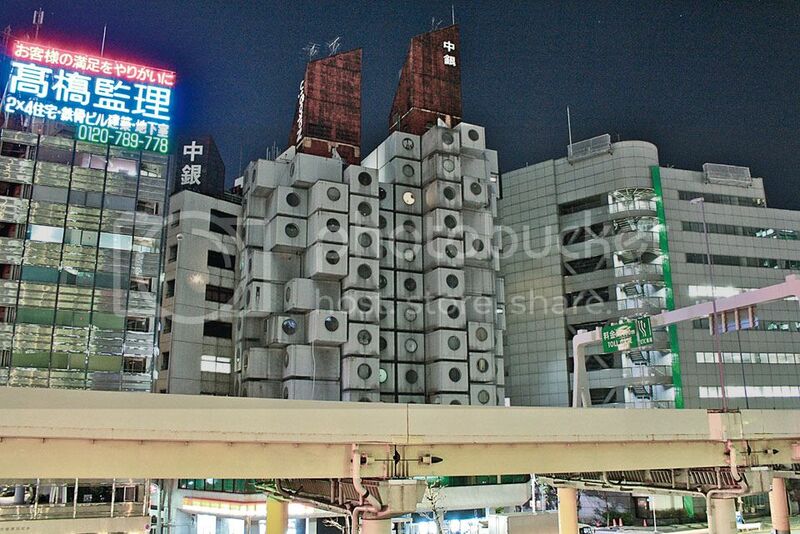 Faced with this situation, Kurokawa proposed an obvious solution: “Why not replace the old capsules with new ones? That was the idea all along.” However, the idea fell through. Six years have passed since then and the doubts regarding the building’s future remain. At over 40 years since its completion back in 1972, the tower that was a modern icon is now seen by some as obsolete, and even a bad idea. Nevertheless, maybe the update suggested by Kurokawa could revive the idea that sustained the building’s conception to begin with. 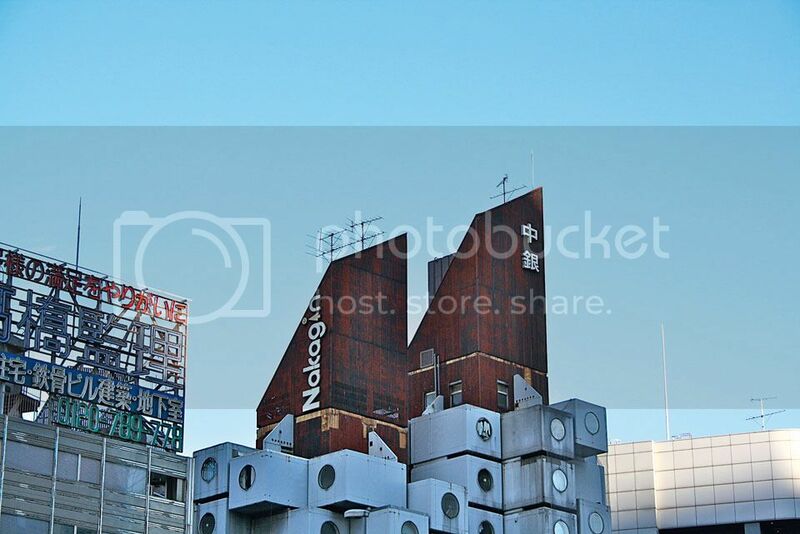 The idea of demolition and renewal was an integral part of the Metabolist ideology, so it’s somewhat ironic that there’s all this controversy surrounding the tower’s demolition, updating and current state of decay. Tokyo has changed a lot since the ’70s. At first the tower stood alone, but over time it found itself surrounded by tall buildings. Facing it, a once busy highway is now closed, with no cars crossing it any longer. During the ’90s several skyscrapers were built across the street, blocking the sunlight that arrived from the south. The convenience store is not the same.